Quarktet now builds customized GCLAD systems! See GCLAD-in-A-Box for details. Airborne acoustic waves create changes in the air's density. This is the general description of a sound wave. The changes in density also produce changes in the air's index of refraction. A light beam traveling through this section will deflect slightly from its intended path. A position-sensitive photodetector that receives the light beam could translate the acoustic signals into electrical signals without any mechanical components. This is the concept of Gas-coupled Laser Acoustic Detection, or GCLAD. This type of detection has been demonstrated before as the light traveled through acoustic fields in liquids or solids, but Dr. James Caron was the first to demonstrate this property in air. 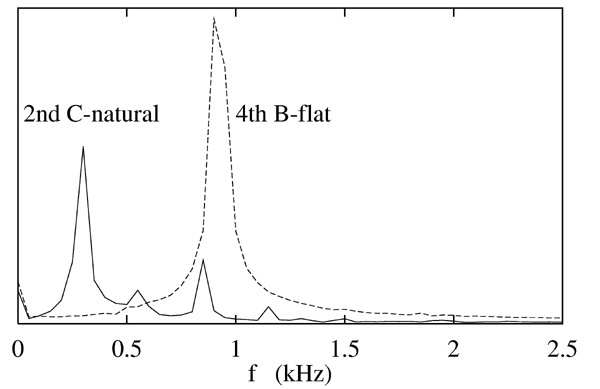 Since the discovery, the instrumentation has evolved such that highly resolved waveforms have been detected in both the ultrasonic and audio frequency ranges. Quarktet continues to research this technique and has an operational system in our lab. The system will be used to investigate new optical, mechanical, and electrical designs that will further enhance the capabilities and sensitivity. GCLAD was developed at the University of Delaware as an alternative method to detect ultrasound after it has been transmitted through a solid material, primarily for composite materials. This technique was incorporated into our laser-based ultrasound system. Laser Ultrasonics (or Laser-based Ultrasound) is the generation and detection of ultrasonic waves with lasers. When a laser pulse strikes a material, the material converts the light energy into thermal energy causing the material to locally expand near the impact point. This expansion creates the ultrasonic wave. There are several ways to detect the wave once it has passed through the material. Typically these methods reflect a laser beam off of the surface of the material. The reflected light is gathered in an interferometer which then converts that to an electrical signal. These techniques have one major disadvantage, the system is inherently dependent on the optical qualities of the system. They function really well on mirror-like surfaces, and not-so-well on others. With GCLAD, the detection beam never touches the surface, so it works well on all types of materials. GCLAD also requires no electro-optic stabilization, or fine-tuning. A general setup is shown below. The primary challenge is the design of the photodetector. The deflections, as you can imagine, are quite small. The Quarktet photodetector has been optimized for sensitivity to beam deflections at ultrasonic frequencies. We have several prototypes and ideas for further improvements. We also have ideas to improve system sensitivity, such as multi-pass detection, and multiple beam detection, that would dramatically improve the sensitivity we have gained to date. For further information, see our research page. 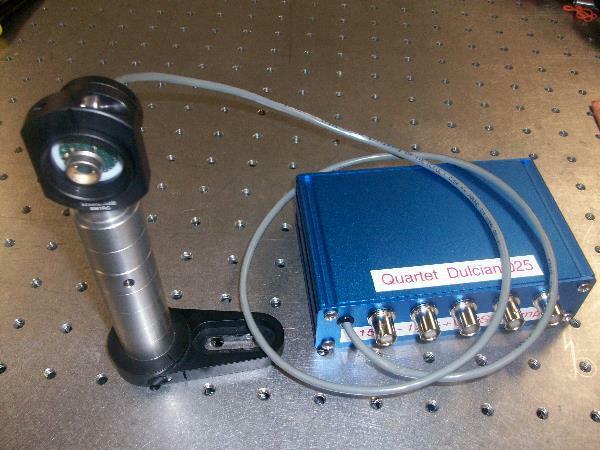 Fig2: Quarktet's Dulcian Detector, built for a customer who is using ultrasound to interrogate skin tissues. Audible Sound There is little difference between detecting ultrasound and audible sound as far as the concept is concerned. Changes in the air's index of refraction caused by the sound waves deflect the beam of the light from its original path. To maximize sensitivity, a different photodetector is used, and we have developed some simple amplifiers. The technique has been used to record such acoustic waveforms as clapping, the human voice at normal, and musical instruments. Shown in the figure below is a sound wave produced by a bassoon, played by the inventor. Fig 3: Several notes played on a bassoon and recorded by GCLAD Fig 4: Fourier transform of the tones. 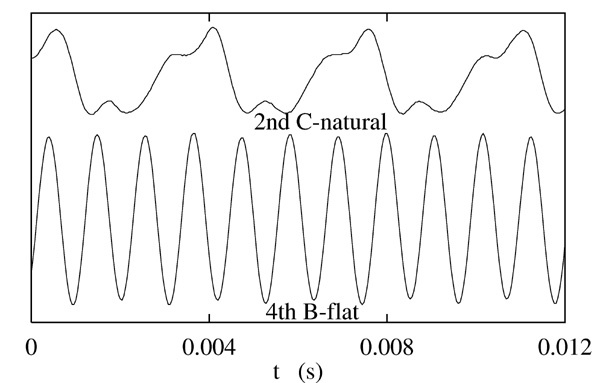 As evident in the sound wave, the low C-natural contains several overtones. It is easy to envision some applications where this technology would be useful, such as remote sound recording, and directional recording. However, this concept has never fully taken root for fear that the lasers involved would be to expensive to justify. This need not necessarily be the case. Using improved electronics, and multi-path detection, the price tag can be reduced significantly.